Digital ObjectRescue Professional recovers lost data from a whole host of multimedia devices, from digital cameras, audio recorders, MP3/WMA players to PCs, PDAs and mobile phones. The program supports recovery from Hard Drives, CompactFlash cards (type I/II), IBM Microdrives, SmartMedia cards, MultiMedia cards (MMCs), Secure Digital (SD) cards, Memory Sticks, and more. Supports a wide range of file formats: DOC, XLS, ZIP, RAR, JPEG, AVI, MOV, MP3, WMA, WAV, etc. 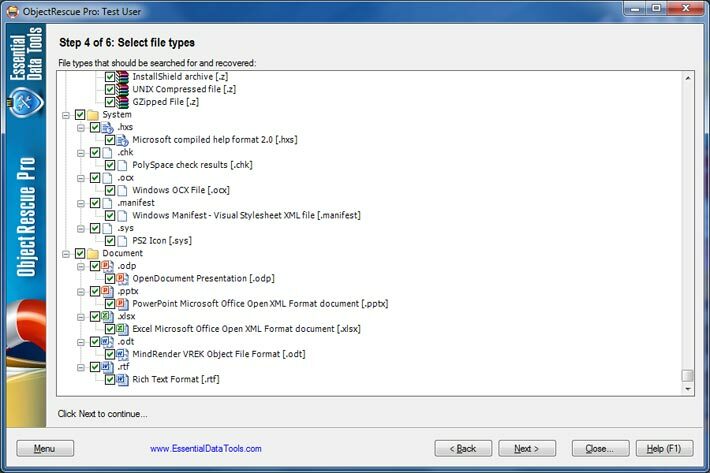 ObjectRescue Professional features innovative recovery algorithms and contains advanced data recovery capabilities that allow you to search file types including music files, images, video, documents, mail and more. As you know, new digital devices allow files to be erased and the space on the media reused. Sometimes, your information can be erased or damaged, either by physical damage to the media (e.g. flash card crash), or because someone clicked the wrong button. An important file can be accidentally deleted in a flash! The media might also be bulk erased or formatted, removing any files from storage. Of course you don't want to lose your important data. Our ObjectRescue Professional is ready to easily, quickly and absolutely reliably reconstruct any lost files.